It’s one thing to have achieved long-running success as a professional drummer, but it’s quite another to have reached a point where you’re juggling multiple successful threads within the music world - that’s exactly the position Ian Matthews finds himself in. Most of our readers will be familiar with Ian through the bombastic role he plays in Kasabian, the band he joined 14 years ago. In that time, Kasabian has built a huge following through their Britpop-inspired indie rock and fierce live reputation. Six albums (including five Number Ones), countless smash singles and umpteen headline gigs (including Glastonbury and the Isle Of Wight) later, the band is still riding high, and newest album For Crying Out Loud is Kasabian with the swagger dialled up to 11. I actually went to watch Buddy Rich in ’86, a year before he died. Ian took the leap into professional drumming at the age of 19, teaching and gigging to pay his way. He still loves to play outside of Kasabian duties today and when he’s not on the road, Ian can be found behind the kit in Bristol bars and clubs laying down blues, funk or a tasty medium swing. The melting pot of influences that make up his colourful playing style was ingrained at a young age. Raised on jazz, Ian was lucky enough to witness Buddy Rich live. He also immersed himself in marching band, played in big bands and fell in love with Gadd’s groove. Meanwhile, he was also being turned onto the frantic beats of Iron Maiden and other New Wave Of British Heavy Metal trailblazers. Aside from his laid-back personality, it’s this eclectic drumming style that has made him the perfect conduit for Kasabian guitarist and visionary Sergio Pizzorno’s songwriting. Serge will bring breakbeats and musical references to Ian, confident that he can match them in style, feel and sound from behind the kit. But that’s not all: in addition to studio sessions for films including The Fast & The Furious and I Give It A Year, in 2015 the industrious drummer joined forces with master drum craftsman Keith Keough and drum-obsessive and comedian Al Murray to launch the British Drum Company. In three short years the brand has become a household name, in no small part down to their vintage-style cold-press moulded shells, plus the fact every prototype is rigorously road tested by Ian everywhere from Bristol clubs to festival stages around the world. The rhythm section between you and Chris [Edwards] on bass is an integral part of the Kasabian sound. Tell me how the chemistry works between you both? “I met the band back in 2001. They came to Bristol to do their demos before they were signed. Then I did bits and pieces with them when they got signed. I’d go up to the farm and do session stuff up there. "They did a little unofficial festival for them and their mates. I went up and stayed the weekend. That was the first time I played with Chris. We’ve always got on really well and our two roles really interlock. I’m very much driving the band along from the back. I’m dropping bombs all over the place. "There is light and shade, of course; you need to ease off in different sections of songs and different songs need a different dynamic, but like with most rhythm sections, most bands actually, everyone has to fit in their place. So, I’m the one laying down the law and Chris floats around that. We perfectly compliment each other. “Chris was ill one day and one of our guitar techs filled in. He’s a really handy guitarist and a good bass player. He likes heavy rock, metal even. He was fantastic standing in, but it became too rock. Your groove is a key element of the band’s sound too. Who or what influenced that side of your playing? “I come from a mixed background of musical taste and interests. I was raised on Buddy Rich, but I’m also a child of the 70s so I had classic rock going on around me, and disco, funk. "I actually went to watch Buddy Rich in ’86, a year before he died, at the Colston Hall in Bristol. I also remember watching the Old Grey Whistle Test on a black and white television. There were men with big sideburns and big fuzzy hair with pencil hardware that would shake. I loved that drama. “I was in a marching band when I was 10. I remember the head of the drummers sat me down one day and made me watch Steve Gadd: Up Close. At the time to me he was so cool, letting beats just flop out of himself; the coolest s**t.
“Then I hit my early teens. The first album I bought was Live After Death with our friend Nicko on it, so I guess I’ve got screaming metal going on in my veins. I was raised on jazz as well and, of course, I’m of the age to remember going to see Grease at the cinema. "I could read, so I was also doing Big Band gigs around Bristol with middle-aged men, semi-pros, ex-pros, having my Whiplash moment and being yelled at, like, ‘Swing!’. So how does that style work within the realms of Kasabian? “Serge’s palette is huge. Those boys came up through the Britpop era, Oasis, Primal Scream. Serge is using breakbeats from all eras and listens to music from all eras. He’s bringing rhythmic ideas and challenges to me when we’re recording, whether it’s old-school rock, old-school jazz, hip-hoppy stuff. It suits me down to the ground. "A lot of modern drumming, heavy drumming, seems much more angular to me, where I’m more circular. I’ve listened to some of the guys who can do all that stuff and can play those kind of feels. I admire them, but I don’t think I could do it. I probably could if I put my mind to it, but it’s not so natural, y’know. It’s not that I don’t care, but I’ve obliterated that red light fever. When writing drum parts for Kasabian, how much comes from you and how much is dictated by Serge as the main songwriter? “He is the songwriter of Kasabian and always has been. Serge will use references or there’s been a couple of occasions where I’ve kicked something off. There’s Swarfiga on West Ryder [Pauper Lunatic Asylum]. "That was me sound-checking a kit that was set up in the studio in Leicestershire. We put these mics up and I started tapping off some drum and bass type stuff. Serge was like, ‘Do that again, that’s amazing!’ He tapped out the tempo on the metronome, put a click on it and got me to play for three minutes. He took that away and he created Swarfiga. “Another time I went into the same place. I had this old Rogers kit from the 80s. It was 24", 13", 16" and 18", a big old thing. Serge was listening to loads of glam rock when I arrived. I went in and did my own version of the music I’d been listening to for 40 minutes with a cup of tea and again, a similar thing happened. Then Julie And The Moth Man was born." “A lot of my job is not only to thump the grooves out through the band to the audience – which is a classic drummer’s job – but I seem to have this other sub duty of emitting energy into Tom. Particularly in the early years, Tom really wanted me to dramatise what I was doing as a drummer. What are some of your go-to pieces? “On the last record I had a Slingerland Radio King from the 30s in 26", 13", 16". That was on ‘Bumblebeee’ as well. My old Rogers kit still kicks around and I’ve got a couple of old Ludwigs. For Crying Out Loud is the second album produced solely by Serge. How do Kasabian sessions differ these days with Serge at the helm? “It’s great. It’s been a natural evolution. Serge has always been hands-on anyway, he’s always been in the room. Serge had learned lessons over the years from Jim Abbiss and Dan The Automator, seeing what they do and getting to the point where he can do it himself. [Doing it this way] keeps it more personal as well. Thinking back to those early Kasabian recordings, how has your approach in the studio changed? “I’m much more relaxed now. I met Kasabian because I was throwing myself at studio time. I had red light fever. I got to a point around Bristol where I was saying yes to anything that came in, even if it was for no money. "I was helping out at Bink Bonk Studios in Bristol. They had a downtime project so I recorded for that and they would fling me any paid work that would come in in return. One of those artists was Kasabian. “As the years have gone on with Kasabian doing these albums, then doing specials from Abbey Road or being on the telly and playing live, I’ve got to the point where I can zone out, just like I’m doing a live gig. How hands-on do you get in the studio in terms of sounds, choosing mics etc? “I fill up the studio with drums. We go for it. I use any of the possible knowledge that I have in my head to try and tune drums or match drums to ideas, the dynamic of the tracks, or if Serge has sample loops or examples he wants me to recreate, I use all the knowledge I’ve got to go, ‘Ah, I think that’s a 24" kick’. "Then I also have Laurence Jenkins who’s principally my drum tech. He’s also involved with Serge doing programming and bits and pieces at his studio. He’s an amazing member of the crew. He used to play with Mint Royale and Beverley Knight. Which Kasabian beats are you most proud of on the new album? “Ill Ray (The King) and Bless This Acid House were the last ones I recorded with them in January 2017. Bless This Acid House is just a good old rock and roller. I had great fun doing that. I had some cool fills I was doing on that. Serge was like, ‘Noooo!’ It was counter intuitive. “Of course. And actually I don’t think you’re going to get very far if you harbour those kind of things. You’ve got to know where you stand. You’ve got to have pride in what you do. I still work at what I do. I still try and practise and keep on top of my game. "I’ve become more confident with it through my experiences with Kasabian. That doesn’t mean to say I’m not ready for an outside perspective on what I’m doing. In fact, it’s great because I get to learn from it. If it makes me a better player ultimately… As soon as you stop learning you become arrogant. “People wonder why this or that doesn’t happen for them in which ever part of the music industry. It’s probably something to do with you. Arrogance is one of the biggest things I think that can hold someone back, because, you’re not willing to work with the team, you’re too loud, you’re too complicated, you’re hard work. Kasabian has won multiple NME awards for Best Live Band. What is it about the band’s live show that justifies the awards? “It’s taken work. I’ve been on the road with the band since 2004. It’s taken years and years of experiences of us creating this thing onstage. Tom is a pitch perfect singer. He’s incredible. They’re all talented boys. Serge has really developed an onstage persona. There’s almost two guys at the front there. "We always go about every gig like it’s the biggest, even if it’s the smallest gig. Each one is important. “Backstage leading up to the actual gig there seems to be a little ritual now. We got a touring sound system that goes around with us in flight cases. It’s flippin’ loud! "About an hour before we go on, on goes the music. Tom [Meighan, Kasabian singer] tends to be the DJ before the show, which can lead to some hilarious picks. Then we’re all set up. We don’t sit around in silence on our phones or laptops. All the FaceTime home is done earlier. It’s that hour that we build in, we go out onstage and ‘whoomph’. When we go onstage we don’t mess about. “I think the people that come to see us expect that and you can always feel the excitement in the crowd when you’re side of stage. You go on and they all go off. A pyramid is built between the band and the audience. "There’s a meeting in the middle and it’s such a fantastic feeling when that happens. The music that we perform is high energy, even the slower tunes. We have to craft the setlist to give the crowd time off, so they’ve got the energy to go back into the next tune. “I’m really proud that we’ve been given those awards over the years. It means a lot, although I was never in the music game to be an award-winning musician. In fact, the only reason I became a professional drummer is because I realised when I was about 19 that I was doing these dirty jobs - I didn’t take much notice at school, I didn’t have any highfalutin jobs - and I realised I could probably earn a similar amount on a weekend with a couple of wedding gigs as I was getting yelled at by this bully boss. "I thought, ‘What if I could swap that life with this life?’ I could stay at home all day and play drums, maybe get some lessons to get better, do wedding gigs and live off playing drums. That morphed into doing some teaching as well. To me that was success. “The Big Softy was my pet name for a snare drum Keith had made that I’d used on some studio sessions. I played it on a mate’s recording and it was used on For Crying Out Loud too. I’d referred to it as the Big Softy, because that’s what it was. It was deep, fat and chewy – the perfect snare sound. Your live setup features some pretty big drum sizes. Has that always been the case? “I remember years ago, when I first started touring with Kasabian, I used what I would naturally use at my more local level of playing. I was using the 22", 12", 14", 16". Maybe I had a 22" ride and two 18" crashes, two different models. We did an Oasis tour, I think it was 2005. "My drum kit was backstage on the rolling riser and I was looking at Zak [Starkey]’s kit - 24", 14", 18" - and Chris Cester from Jet’s kit. Zak had 20" crash cymbals and a 22" ride. I think Chris had a 21" sweet ride, also with 24", 14", 18". My kit was technically bigger with more toms, a china and two crashes, but it looked small. I know you can make any drum kit sound big through a proper massive PA with a proper engineer, but I came to the conclusion that my drum kit didn’t look big enough for what we were doing. Tell me more about your live setup? “It’s a fairly simple rig. I use a British Drum Company Legend series kit with birch shells and sharp 45° bearing edges. They’re thin shells with thin reinforcement hoops. The drums are really wide open and I use them wide open. "Occasionally, at soundcheck Laurie will apply a bit of MoonGel for a little bit of focus because of the room or what our engineer wants, but I tend to have a wide open, fat sound. The Legend series is perfect for that because it’s got cut as well as that fatness. “I use complete heads on my touring rigs. I have a sponge in the bottom of the bass drum with a flat PZM-type mic and I’ve got a Kelly Shu with a mic in it right in the centre. Do you use any triggers? You play jazz, funk and blues gigs around Bristol during Kasabian downtime? Is that something you’ve always done? “I’ve got all my mates in Bristol that I’ve played with for years and years. When I’m back in town they’ll give me a call and say ‘do you want to do a gig?’ I still do all that stuff and I love doing that because of the contrast from Kasabian, having to go in and set up a small kit and play. "I play with a violinist, upright bass player, piano player, sometimes maybe a guitarist where you have to keep it suppressed and super down. When I’m off tour it’s super challenging to do and it keeps my discipline in shape. Does this playing outside of Kasabian feed into your playing within the band? “When I go back in the studio with Serge I might have my little Ludwigs up and he’ll have me doing these tasty drum breaks, loops or he’ll get me doing little flavour-y stuff with cymbals and toms. Or on some of the more quiet tunes he’ll want me to play in a more ethereal way. That comes straight from my jazz playing. Do you do much recording outside of Kasabian? Let’s talk about the British Drum Company. Keith Keough is obviously the master craftsman, but you must have been hands-on when the company was getting off the ground? “I had much more going on in the beginning, back in 2015 into 2016. We were to-ing and fro-ing ideas. I was involved with the early meetings about our overall direction. We came to the conclusion very quickly that we were gonna go Art Deco. "That had been lost in modern drums and it’s a beautiful thing. We’re very aware that there’s a buoyant interest in the vintage drum world and we create our shells the old way, so I’d say we’re creating modern vintage drums. That’s very much a cheap saying nowadays, but we really are and we thought Art Deco was the perfect way to encapsulate that. A major part of your role has been to road test the gear? “Yes, because I’ve got all these different avenues - the small pub gig where I’m loading my own gear in and out of the car and then doing medium and bigger gigs with Kasabian. What are you looking for when you’re testing a snare drum, for example? “A great snare drum with tuning range, bite and tone. I don’t want anything crispy and wispy with funny overtones, or where you can’t engage the snares properly. I suppose we all have a perfect snare drum situation in our mind. I do know from experience that the perfect snare drum can come in many guises. "Sometimes, it depends on what track you’re recording. Someone said this to me years ago - you can have the world’s most expensive snare drum on a session. You might have done a tune on it, then you get that little click from the control room and the little voice going, ‘Yeah great, the snare’s really good. Got something else?’ You put some drum you got off eBay up and it’s perfect. What’s your favourite BDC product at the moment? Three years in, what do you think the future holds for BDC? 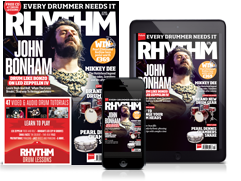 “It seems like we’ve become part of the furniture within the culture of drumming quite quickly. I think, even in 2016, people immediately forgot this is just a bunch of blokes putting a company together running it from the ground up. "They were chatting to us like we were Mapex, but we’d only just started! It was literally three guys making shells. We were gritting our teeth and literally jumping off a building without a parachute and hoping it was a soft landing. People very quickly forgot that. People were treating us like a big company straight away. “On a serious point, the next step of the company is to create as much productivity from what we’ve got and the team we have. We’re moving into the marching side with Stu Warmington our ex-Royal Marine. We’re in deep talks with various stuff on that side. "There’s a whole other world of expansion, which is deeply exciting. I’m waiting to see the drummers who will be playing our drums over the next few years going out to festivals; seeing more and more people using our drums.